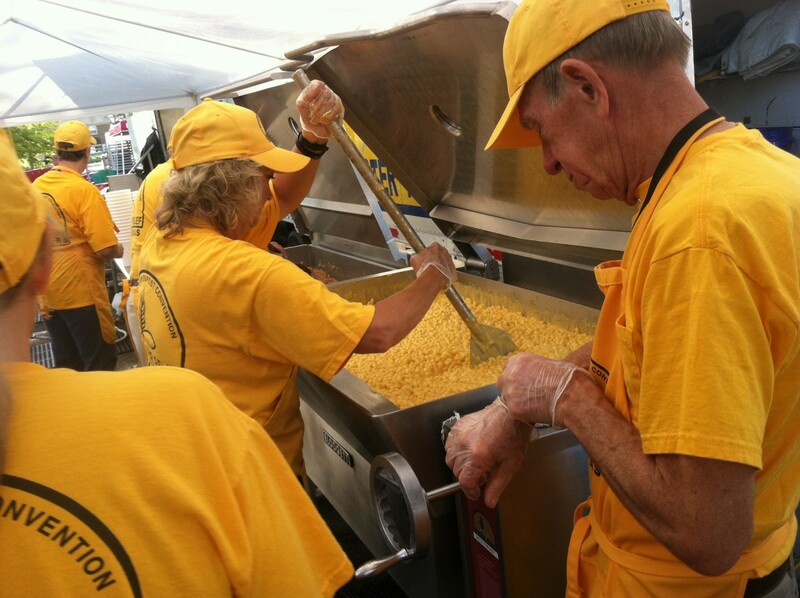 Preparing and serving hot meals is the backbone of Southern Baptist Disaster Relief ministry. With this in mind, every Oklahoma volunteer is trained to work on the feeding team. Specific training is provided in maintenance, warehouse, sanitation, cooking and line serving. After completing feeding team training, volunteers may train in other areas of Disaster Relief service. Assessment team members must have previous training in our Disaster Relief chain saw and mud-out recovery work. On the job, every volunteer must put safety first. Team members are expected to be constantly on the alert for hazards and take the necessary precautions to protect both self and others. Volunteers are required to use safety hear to protect hands, head, ears, and eyes, as will as wear the proper clothing including chaps. Child care volunteers provide a calm atmosphere and competent, loving care for children. Care is provided to give parents the opportunity to salvage remains of belongings, meet with helping agencies and insurance representatives, and take care of other business. Team members will travel to the disaster site and establish a child care center in temporary space, using books, toys and other resources that they will take to the disaster site. The center is set up in the best available space adjacent to the areas to be serviced. It may be located in a school, church or business that is unaffected by the disaster. Volunteers will care for the children during the day. The center is usually open from 8:30 am to 5:40 pm. Child care volunteers should love children and have previous experience working with preschoolers and elementary-age children. Team members must consent to a background check before serving. This group provides clean water after a disaster has occurred. Portable water purification units are used to sanitize available water on location, making it safe for drinking, cooking, bathing and other uses. The MRC is made up of DR trained volunteers prepared to give medical aid to disaster victims. They have been approved by Homeland Security for this service. Some are licensed or certified in some field of medical care, but others serve as secondary personnel to make the team’s effort more efficient and to care for more victims. There must be a physician on every team, but any person who is interested can be a member. Anyone who is willing to do whatever is needed can be part of the team. Some orientation in disaster clinics is desirable. The more medical knowledge one has, the more helpful they can be. Professional people can be more efficient and see more patients if they have additional help. 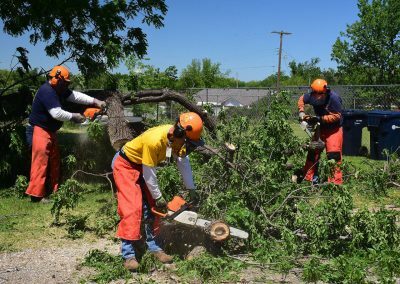 After attending the Medical Reserve Corps training at an Oklahoma Disaster Relief training session, an application must be filed with the ODRMRC and OMRC. Volunteers must be fully documented in Disaster Relief and MRC prior to being deployed on a team. Once the documentation is completed and a background check is done the volunteer is ready to serve. Personal certifications and passport should be kept current. December 11, 1973 – BGCO Board of Directors adopted a plan for disaster relief ministry. The plan entailed organization on a local church, association, and state convention level. Included was: financial aid, immediate emergency assistance, and repair/rebuilding as necessary and requested. This began to be implemented. When Alaska was hit by earthquake, men went to help with repair and re-building of damaged churches. The first response given financially was in North Central Oklahoma (Enid area) when flash flooding destroyed much property. A free-will offering was taken in churches throughout the state and over $25,000 was divided among all victims (individuals and churches). In 1974 another appeal was made for an offering to be received for victims of a devastating tornado in the Drumright/Olive area. Subsequently, an amount was set aside from the Oklahoma Cooperative Program budget and the Edna McMillan state missions offering for a permanent Disaster Relief fund. Funds for disaster victims are to be requested and distributed by the association in which the disaster occurs. From that first team response in mass feeding at a disaster site, the ministry has grown to massive proportions. Over 5000 trained team members are organized into five geographic zones encompassing the state. They are trained to respond quickly and provide hot meals to large numbers in a short period of time. 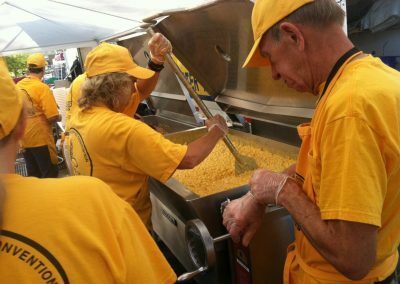 After the 2004 Florida hurricanes, over 14,600 hot meals prepared were prepared in one day from the large mobile kitchen – a new record high. As the ministry has developed, several areas have been added in addition to hot meal service. 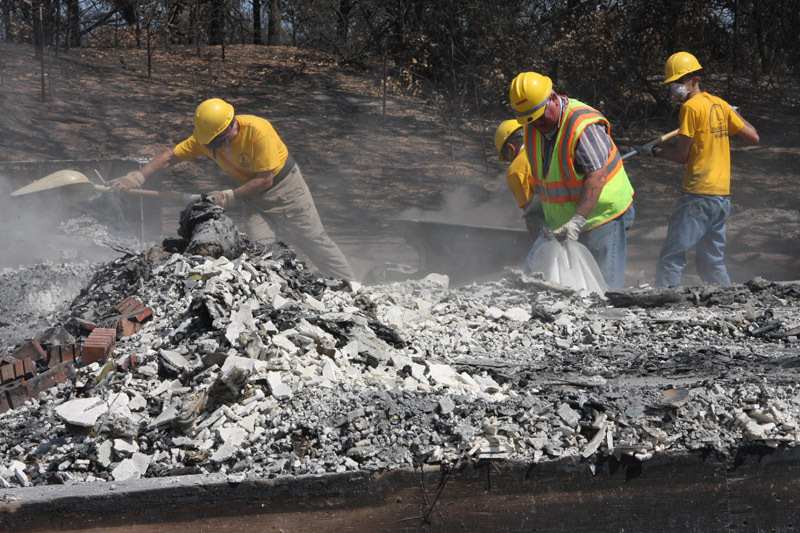 Volunteers also can provide water purification, mobile showers and laundry, chain saw debris removal, mud-out,ash-out, child care, and medical assistance.